Currently viewing the tag: "Siberia"
We’re starting to plan for next summer’s rafting trips on the Sayan Oka River and came across these videos you might enjoy. 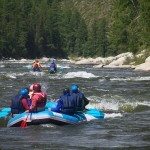 The first one has some great music and a couple of traditional Russian catamarans running some of the bigger rapids. Heere is some video of a flip at Okinskij (Oka) Rapid. Please call us at (541) 386-2271 or email us at info@raftsiberia.com to book a trip or if you have any questions.